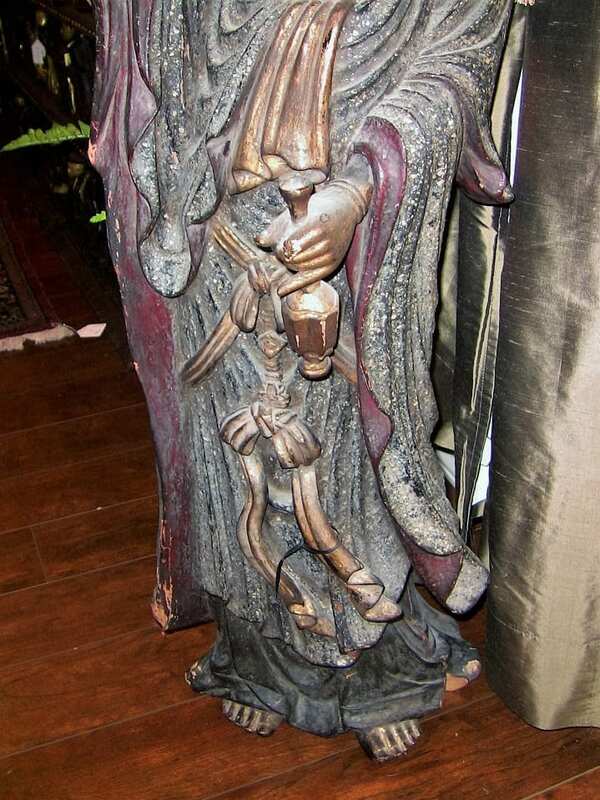 19C Asian Wooden Carved, Painted & Gilded Guanyin Statue. 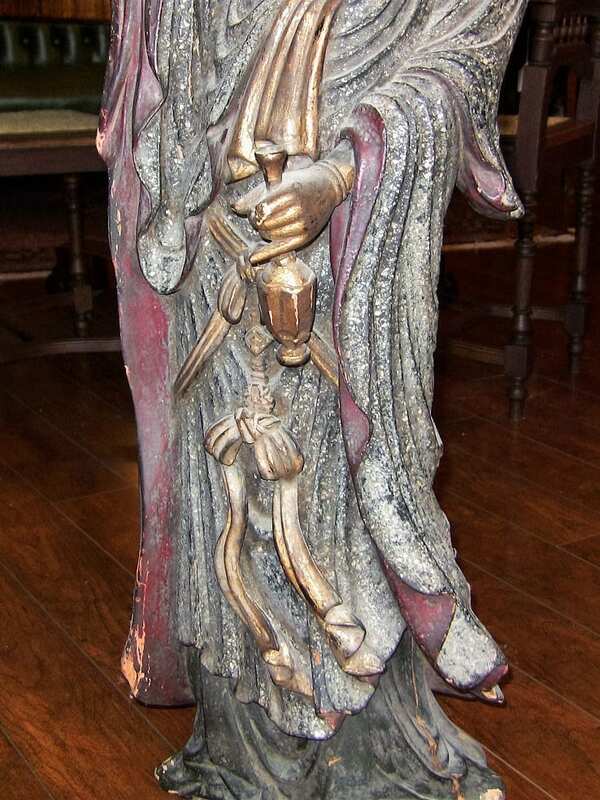 PRESENTING A STUNNING 19C Asian Wooden Carved, Painted & Gilded Guanyin Statue. 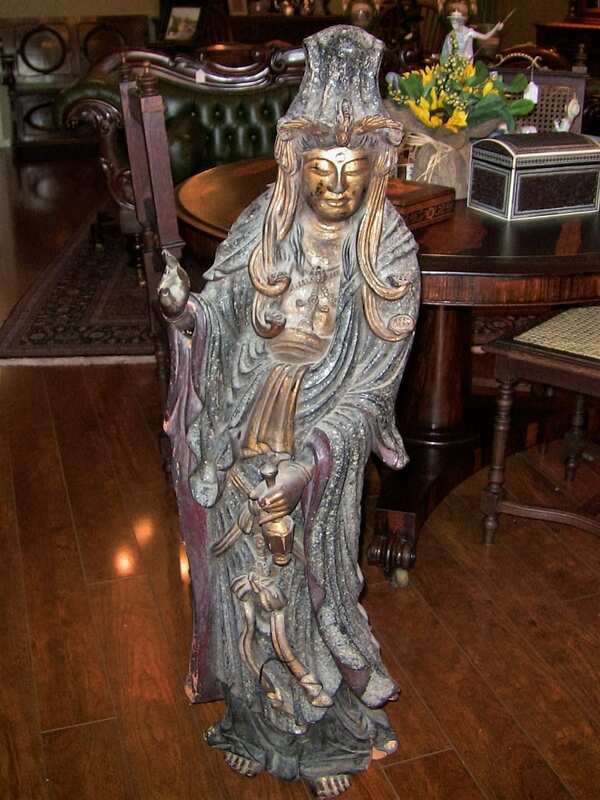 This Wooden Statue is hand carved, hand-painted and hand-gilded. 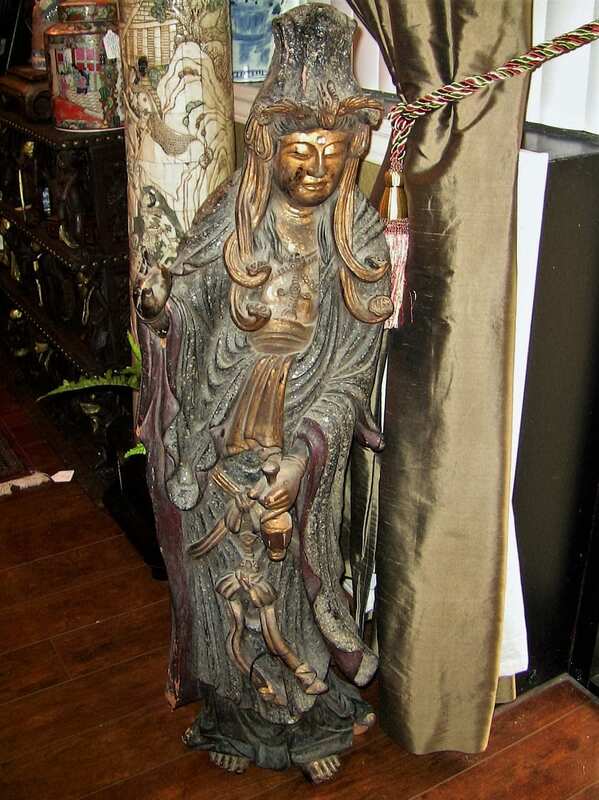 It depicts the Buddhist Goddess of ‘GUANYIN’. 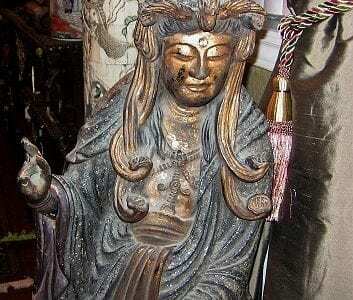 Guanyin is an East Asian bodhisattva associated with compassion as venerated by Mahayana Buddhists. She is commonly known as the "Goddess of Mercy" in English. The name Guanyin is short for Guanshiyin, meaning "[The One Who] Perceives the Sounds of the World". 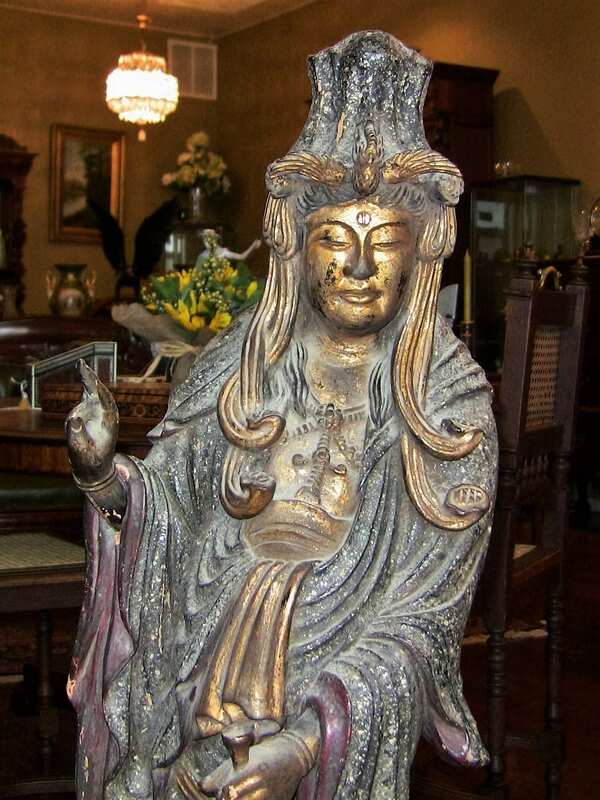 She is also referred to as Guanyin Bodhisattva (traditional Chinese: 觀世音菩薩; simplified Chinese: 观世音菩; pinyin: Guān shì Yīn Pú Sà). Some Buddhists believe that when one of their adherents departs from this world, they are placed by Guanyin in the heart of a lotus, and then sent to the western pure land of Sukhāvatī. 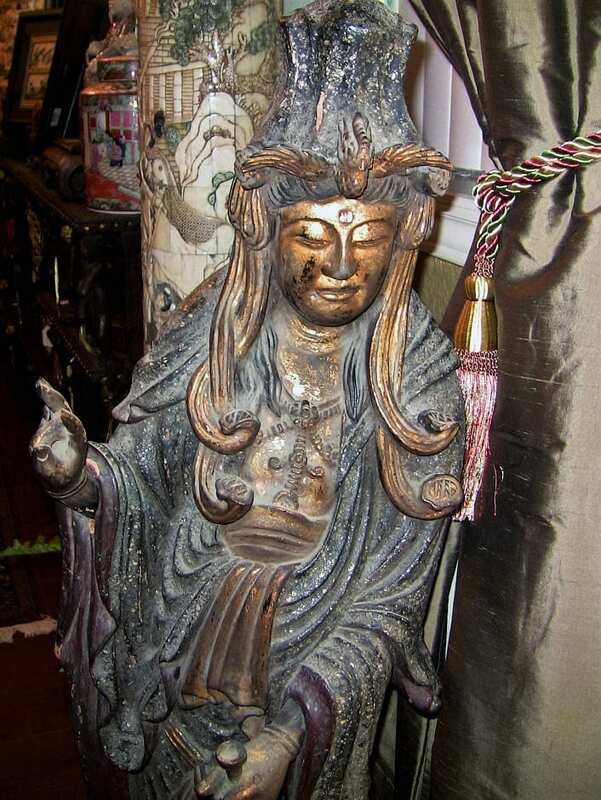 Guanyin is often referred to as the "most widely beloved Buddhist Divinity" with miraculous powers to assist all those who pray to her as listed in the Lotus Sutra and Karandavyuha Sutra. Several of the biggest temples in East Asia are dedicated to Guanyin including Shitennoji, Sensoji, Kiyomizu-dera and Sanjusangendo as well as Shaolin. Guanyin is beloved by all Buddhist traditions in a non-denominational way and can be found in some of the most important centers of Indian Buddhism including the Mahabodhi Temple, Ajanta Caves and Nalanda Museum as well as most Tibetan temples where He is referred to as Chenrezig. Furthermore, Guanyin can also be found in some influential Theravada temples such as Gangaramaya and Kelaniya of Sri Lanka as well as the Asian art sections of most museums in the world as a widely depicted subject of Asian art and sculpture. Some Buddhist and Christian observers have commented on the similarity between Guanyin and the Blessed Virgin Mary. 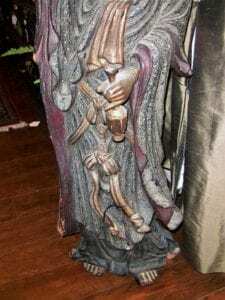 This can be attributed to the representation of Guanyin holding a child in Chinese art and sculpture; it is believed that Guanyin is the patron saint of mothers and grants parents filial children, this apparition is popularly known as the "Child-Sending Guanyin" (送子觀音). One example of this comparison can be found in the Tzu Chi Foundation, a Taiwanese Buddhist humanitarian organisation, which noticed the similarity between this form of Guanyin and the Virgin Mary. The organisation commissioned a portrait of Guanyin holding a baby, closely resembling the typical Roman Catholic Madonna and Child painting. Copies of this portrait are now displayed prominently in Tzu Chi affiliated medical centres. It is suggested the similarity comes from the conquest and colonization of the Philippines by Spain during the 16th century, when Asian cultures influenced engravings of the Virgin Mary, as evidenced for example in an ivory carving of the Virgin Mary by a Chinese carver. The statue of Guanyin(Gwanse-eum) in Gilsangsa Temple in Seoul, South Korea was sculpted by a Catholic sculptor Choi Jong-tae, who modeled the statue after Virgin Mary in hopes of religious reconciliation in Korean society. 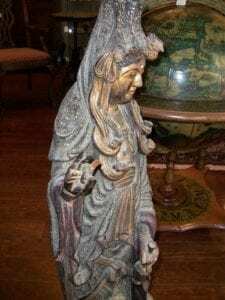 As you are probably aware, many fakes and reproductions of Chinese and Asian religious figures have been made and sold on the Market. We are of the OPINION however, that this is not a modern reproduction. We are of the opinion that it is a 19th Century Carved Figure made in Southeast Asia, most likely in Korea. The wood has what appears to have natural aging rather than false aging. The base of the statue is clearly indicative of this. 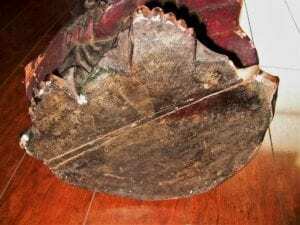 The gilding is intact on most of the piece but again shows signs of natural aging. Likewise, the painting looks aged and authentic. 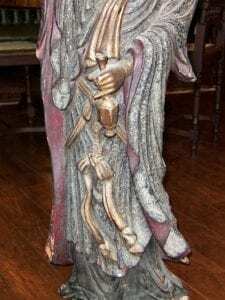 The statue has a very unusual texture to it.....it appears to be covered in a form of lacquer which has incorporated tiny pieces of glass which gives it an overall marbled effect and it glistens in the light. The figure is in a standing pose, with right hand and finger pointing upwards and the left hand holding a bottle. She is wearing a headdress with trailing veil and the hat has a bird as a centerpiece protruding from the forehead portion. She is in a flowing robe, with sashes and necklace decorations. Her hair flows downwards on both sides of the hat ending in curls. We would be of the opinion that this piece is possibly mid to late 19th Century....circa 1860 - 1880. It is in REMARKABLY GOOD CONDITION considering its age. Provenance: Part of a Private Collector's HIGH-End Collection of over 30 years. Condition: Very good original condition. One or two minor losses as is evident from the photos.